Captain Joseph Nicholson Captain Joseph Nicholson, one of the stalwart old-time lake mariners, is now a prominent citizen of Detroit, Michigan. He was born September 25, 1826, near Kilkeen, County Down, Ireland, about half a mile from the Irish Channel. The Captain has been superintendent of the House of Correction in Detroit some twenty years, and notwithstanding his mature age, is full of vitality, taking an active, public-spirited part in the municipal affairs of the "City of the Straits." Captain Nicholson is a son of Thomas and Jane (Small) Nicholson. His grandfather, Joseph Nicholson, was a country gentleman in good circumstances. Thomas Nicholson received an education in the military schools of Dublin, and was commissioned as lieutenant, being soon afterward promoted to captain of a body of troops designated as yeomanry, equivalent to American militia. Grandfather Small, on the maternal side, took an active part in the Irish Rebellion of 1798, and was considered as a "firebrand" by the government. A troop, known as the "Welsh Horse," was sent to procure his arrest for what was considered treasonable speeches and practices. He was convicted and sentenced to be shot. His cousin, General Waring, who had espoused the side of the government, secured his release, but his estates were confiscated and were afterward bestowed on General Waring's descendants by royal grant. It is owing to this reversion of hereditary estates that the Great Lakes are indebted for a skillful boatman and shipmaster, and the City of Detroit for so efficient a superintendent of its House of Correction. He had peculiar educational advantages in his youth. After attending the public schools of his native parish, he became a pupil in a girl's academy, where he remained eighteen months with good profit to himself. He also attended a school of navigation, and received private instruction from a retired sea captain. As a boy he was an expert boatman, and excelled as a strong swimmer and surfman, being instrumental in many rescues from watery graves. In 1844 young Nicholson adopted the life of a sailor, joining the ship Hannibal at Liverpool, in the coasting trade, as boy. After making several trips, he shipped on the full-rigged ship Sisters, of London, and made a voyage to America. Leaving the ship at Quebec, he took passage on a steamer and ascended the St. Lawrence river, first stopping at Brockville, thence proceeding to Toronto and Hamilton, and finally to Oakville, where he secured work in a shipyard and sail-loft. There he remained until the spring of 1846, when he shipped on the schooner Elizabeth, transferring to the Amelia, and closing the season on the Royal Tar. That winter he worked in the sail and rigging loft, repairing and making sails. In the spring of 1847 he went to Oswego and shipped with captain Duncan McCollum on the new canal schooner Manitou. This was during the days of the faction, race and religious fights on the line of the canals. One of his duties was to assist in the opening of the locks, and he was always prepared to take to the waters of the canal in an emergency, being barefoot and wearing only a guernsey shirt and pants. In 1848 he went to Cleveland and joined the schooner Jenny Lind, with Captain Spencer as pilot, later transferring to the schooner Argo, with Captain Harrington. He left the Argo at Oswego, and took passage on a steamer for Lewiston, thence traveled by stage to St. Catherine's. Ship fever and cholera being prevalent at Kingston, he went to Buffalo. In the spring of 1849 Mr. Nicholson shipped with Captain John Bantom in the brig Sarah Walbridge, and later with Capt. G. Britton on the schooner Oconto. During the next season he shipped with Captain Moore on the brig Cumberland, which carried the first cargo of piles used in the construction of the Waugoshane lighthouse. While he was a shipmate on the brig, it was occasionally necessary to take to the yawl boat and row to another vessel in order to borrow food, the supply on his own vessel being inadequate. In the spring of 1851 he entered the employ of Capt. Eber Ward as wheelsman on the steamer Detroit, closing the season on the Champion, and remaining with that noted line eleven years. While with Captain Ward, there was but no one on the vessel nearer to him than our subject, and, if the steamer had to make unusually early trips in the spring or late ones in the fall, Captain Nicholson was always called upon to make those trips. In the spring of 1852 he was wheelsman on the steamer Sam Ward; in 1853 second mate on the steamer Arctic, remaining part of the next season, when he transferred to the steamer E. K. Collins. On April 27, 1854, he effected a notable rescue, which was recognized by the citizens of Chicago by the presentation of a gold watch engraved with the legend: Presented by the citizens of Chicago to Capt. Joseph Nicholson in appreciation of his noble and gallant efforts to save the lives of the crew of the schooner Merchant, in distress off Chicago, April 27, 1854. Two out of the seven men on the wrecked vessel were saved, and the Captain says that Capt. Charles McGill, now living in Chicago, is the only one alive who was with him at this time. In the spring of 1855 Captain Nicholson was appointed master of the steamer Arctic. The next season he sailed the steamer Planet, until she was sold to a railroad company. In the spring of 1857 he came out on the steamer Montgomery, and sailed her three years. In 1860 he was again appointed master of the Planet, she having reverted to the Ward line. In 1861 Captain Nicholson and others built the tug John Prindiville, and the Captain sailed her until the fall of 1864, in the meanwhile doing some notable wrecking jobs. In 1865 Captain Nicholson was appointed marine inspector for the Detroit Fire and Marine Insurance Company. He performed the duties of that responsible position equitably, and at times took command of vessels when the regular masters were sick or ashore for other reasons. During the time he was inspector for this company he, with Capt. John Rice and Capt. Charles Morley, thoroughly inspected every vessel owned on the lakes, both in the United States and Canada, for this company. He took the steamer Keweenaw around for Capt. A. Stewart, and the Meteor for Capt. Thomas Wilson. He was on the jury before whom Capt. George Cleveland was tried for manslaughter for the sinking of the Pewaubic while he was mate in charge of the Meteor. It was through some questions by Juror Nicholson that enough logic was evolved from the mass of testimony to acquit Captain Cleveland, and Judge Wilkin, before whom the case was tried, gave the junior a high compliment from the Bench. The Captain has also been subpoenaed as an expert in many marine cases. Judge H. B. Brown, one of the associate judges on the Supreme Bench of the United States, frequently called upon him to sit on the Bench with him in the cases of trials of difficult collision cases, when tried in Detroit, and no such cases were ever set aside by the superior courts. 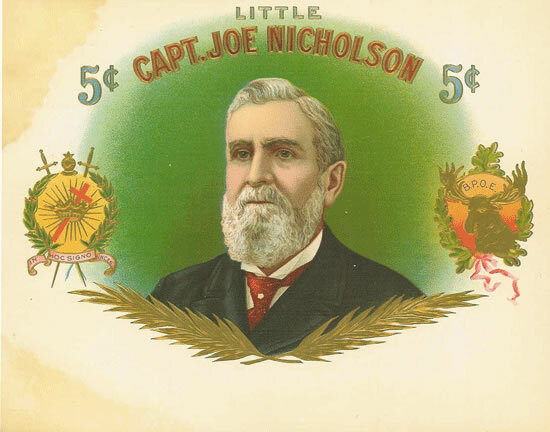 In 1878 Captain Nicholson resigned his agency with the marine insurance copany to accept the onerous position of superintendent of the Detroit House of Correction, and by good business methods he has raised it from a burden on the community to become a paying institution, which is appreciated and testified to by his being chosen to fill the office seven successive terms of three years each. During the twenty years he has had charge of the institution, he has turned over to the city of Detroit, over and above all expenses, more than half a million dollars. His first appointment was made by Mayor George Langdon. Since then the State Legislature changed the law, and his incumbency has been subject to the board of inspectors. In 1885 he was largely instrumental in organizing the Wardens Association of the Unitd States and Canada, of which body he was president many years, resigning that office in 1897. He is a member of the National Prison Association, of which ex-President Hayes was at one time president. The Captain is an ardent and popular fraternal man, being a charter member of Oriental Lodge of Master Masons, of Lafayette Chapter, Detroit Commandery, and a Noble of the Mystic Shrine; a member of the Improved Order of Elks; of the Ancient Order of United Workmen; and of the Ship Masters Association, holding Pennant No. 885. On December 10, 1868, Captain Nicholson was united by marriage to Miss Elizabeth A. Gilman, who passed to the better world in 1896. His children are: Frances Jane, and Mary Louise (now the wife of John L. McDonald, confidential bookkeepr at the Detroit House of Correction). The Captain's daughter, Mrs. McDonald, has recently presented him with a granddaughter, not named at this writing. The family residence is on the corner of Russell and Alfred streets, Detroit, Michigan.